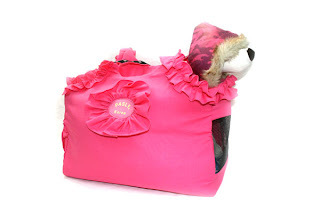 A pet carrier, which can be worn like a handbag, for when you want to take your pet for a walk. That would be a walk where you do the walking and your pet looks out in embarrassment from the frilly pink face hole. Of course, depending on how much your pet weighs, your shoulder may get sore. In that case, pop your little darling into the pet stroller! What pet could be happy without a collar? You have your choice of the trendy bandana collar or, for the more sophisticated lady, a delicate jewelled number. Your cat must have exercise, particularly if she is an indoor cat. 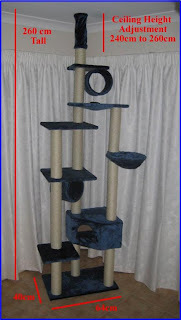 A floor-to-ceiling cat gym should solve that problem. 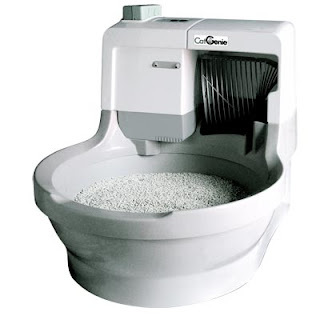 And finally... what kitty household is complete without a self-flushing, self-washing cat litter box? Poor Sophie. She's going to be horribly disappointed when she finds out her new mummy bought a plain, carpeted scratching post from The Reject Shop and will be buying an ordinary old $5 litter tray with no lid and no flush at all, self- or otherwise. Take care chick and have a good weekend. WOW! That is seriously out of control! 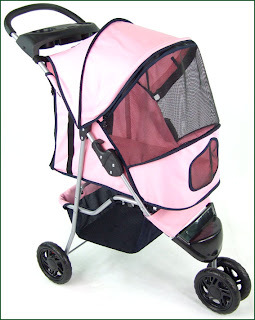 I can't believe you can buy a pet stroller! More to the point, I can't believe that there are people who actually DO buy them! Perhaps the same people who employ the services of the "Pet Photographer" I saw driving around Camberwell last year?! I would just like to have video footage of a cat using a self-flushing litter tray. I think there would be additional puddles to clean up due to fright!! Love it. Ohh, people can get interesting when pets are involved. Oh my gosh those products are amazing! I think I could even have fun shopping for a cat even though I do not even own one. You know you are going to have some fun arent you? Miss Sophie is a gorgeous name! One more week until I can pick her up... even without the cat bling I'm super-excited!